Over the summer the Hesburgh Libraries has been preparing for a busy fall. The Libraries as a system is celebrating the 50th anniversary of the Hesburgh Library building throughout the 2013-2014 academic year. Coincident with the year-long celebration is the opening of a new service and location within the Libraries: The Center for Digital Scholarship. You can learn more about the Center and its services through our library website. As you read, we invite you to visit and explore opportunities to extend your own research and scholarship. 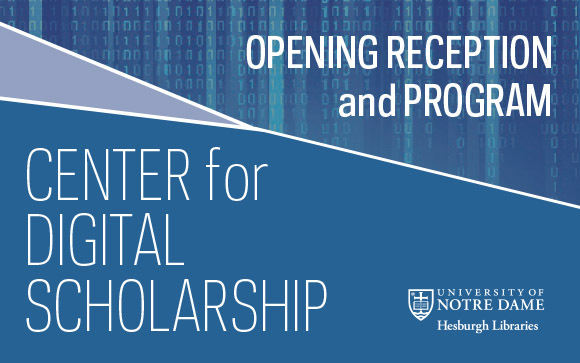 Join Notre Dame faculty and students and alumni, along with special guests, as we celebrate the opening of the new Center for Digital Scholarship within the Hesburgh Libraries. Mark your calendar for the grand opening event scheduled November 1, 2013 from 4:00-6:00 p.m. with formal programming beginning at 4:45 p.m. In the interim we invite you to consider your own research and how you might extend analysis of texts that you study, use geographic information services to visualize important aspects of your findings, or discover what it takes to manage large research projects that include data creation or locating large data sets. Staff are on hand in the Center for consultation and support as you consider your options and begin your work. As the fall semester progresses, please watch for announcements about introductory sessions on the areas of expertise supported and other programming.